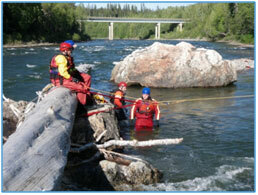 This swiftwater course is open for registration! We'll get you out on local rivers, learning to understand river hydrology and how to work, play, or rescue others safely in a river environment. The course price is $369 per participant ($259 for a recertification) plus tax; register by July 12th. Additional costs: drysuit rental at $40/day, and shared shipping to bring up all the equipment, course materials, etc (averages $20-40 per person, depending on number of course participants).